The SmartCost Calculator for the Emerging Markets? When is Transparency Not Transparent? In last week’s ETF Think Tank research note, we covered our favorite client alignment factor: Transparency. It is our belief that advisors and fiduciaries must know what they own. That said, ETF innovators this past week pushed forward with regulators on a new form of ETF that would limit transparency to benefit active managers that wish to obscure their holdings. Although we applaud these innovators for pushing the envelope, we still ask, “Should these non-transparent ETFs be allowed to offer the same liquidity and tax efficient benefits to advisors as transparent ETFs?” The client alignment factors of tax efficiency and liquidity are actually derivatives of transparency and, in our opinion, would likely suffer in this new non-transparent version of an ETF. Firms like Davis and ARK have embraced the transparent active ETF as fin-tech structures to deliver their investment management services in a superior wrapper. Although we are supportive of innovations like non-transparent ETFs because they will foster new entrants to embrace values of ETF investing, we feel this non-transparent structure is designed to benefit the manager rather than advisors and investors. Advisors should know what they own in order to be fiduciaries. Transferring that trust to trading firms and the investment manager threatens the other benefits of ETFs. Within the ETF Think Tank, Toroso maintains an ETF Security Master Database, built by advisors, for advisors. As we noted last week, the first category places every ETF in a classification based on the underlying holdings, hence our obsession with transparency. Source: Toroso security master as of April 12, 2019. As you can see from the chart above, ETFs are formed under five primary corporate structures, each with unique tax implications. As advisors, understanding and navigating these tax implications can be a clear value add to your clients. Nadig’s article artfully explained the tax efficiency or tax deferral offered by the ETF structure and the fiduciary imperative for advisors to embrace this benefit. 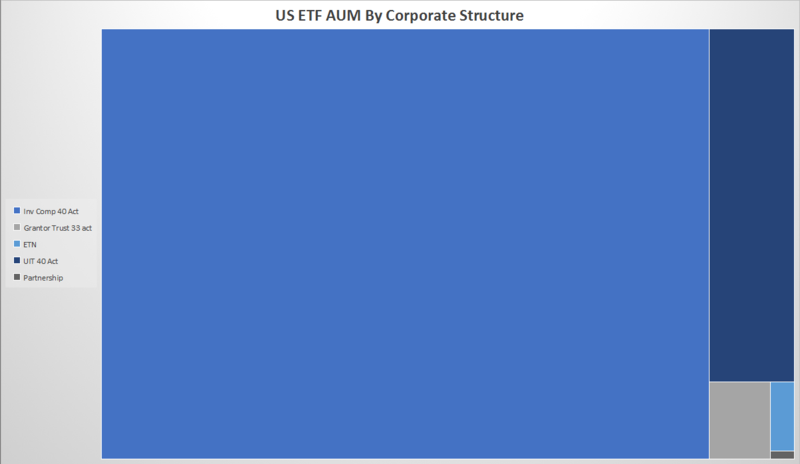 Although only 8 ETFs currently use this structure, it is the second largest in terms of AUM. The very first ETF, State Street’s SPDR S&P 500 ETF, $SPY, was built in this structure. Despite some limitations on ETF portfolio managers in this structure with basket trading and security lending, the tax efficiency appears to be intact. There are 64 Grantor Trust ETFs with $61 billion in assets. They are primarily used for commodities with the largest and most well-known being SSGA’s Gold Trust (Ticker: GLD). The tax treatment here can be quite complicated with K-1s, collectable taxes, and UBTI (commonly referred to as “bad income”). Although they are primarily commodities and currencies, a new sponsor, Metaurus, has developed two ETFs in the Grantor Trust structure that work with equity dividend futures. These ETFs are complicated, and we encourage advisors to engage in the ETF Think Tank for further guidance. There are over 140 ETNs that seek to provide exposure to many different asset classes. An ETN is an exchange traded, uncollateralized debt obligation of a bank, which usually seeks to provide price tracking of an index. In many ways, they are the original non-transparent Exchange Traded Product (ETP) in that the index they are tracking is transparent, but the securities held are unknown and only loosely promised by the faith in the bank issuing the ETN. To that end, they rarely distribute capital gains since they may not hold any assets. ETNs present many other complications, but tax burdens like K-1 and surprise distributions have historically not been a concern. Transparency and Tax Efficiency are two key client alignment factors fostering the growth of ETFs and advisors. 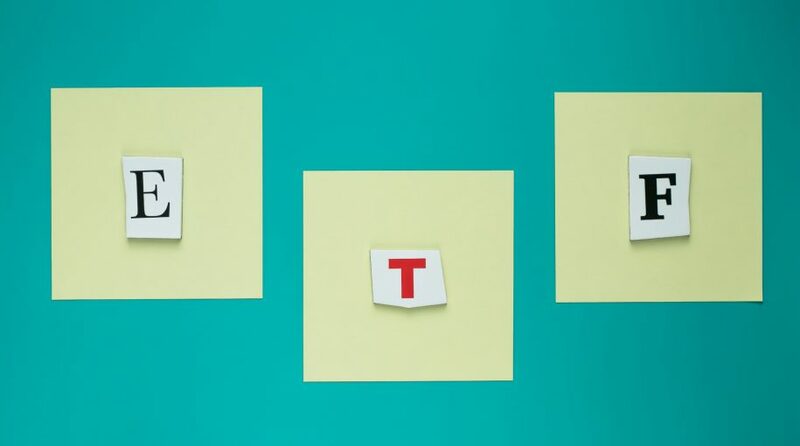 The ability to not only know what is in your ETF, but how tax efficient the corporate structure is, provides advisors with a strong fiduciary value proposition for their clients. The ETF Think Tank is committed to providing research and resources to our community of advisors. This information provided to the recipient by Toroso Investments, LLC (“Toroso”) is intended for use only by the persons or entity to which it was furnished. This information may not be distributed, reproduced or used without the express consent of Toroso. This material has been prepared by Toroso for informational purposes only and cannot be relied upon as tax advice. Although much of the data underlying the information presented has been obtained from sources (e.g., Morningstar and Solactive AG) believed to be reliable; the accuracy and completeness of such information cannot be guaranteed.